The Tau find their path blocked by a huge wave of Imperial torpedoes. Tau fighters and torpedoes move ahead to thin out the threat. IMPERIAL NEWS SERVICE (3 280 735.M41)–Fleet Corvus, under the command of Commodore Gadea Hennard, won a resounding victory yesterday over Tau naval forces orbiting Dar Sai. 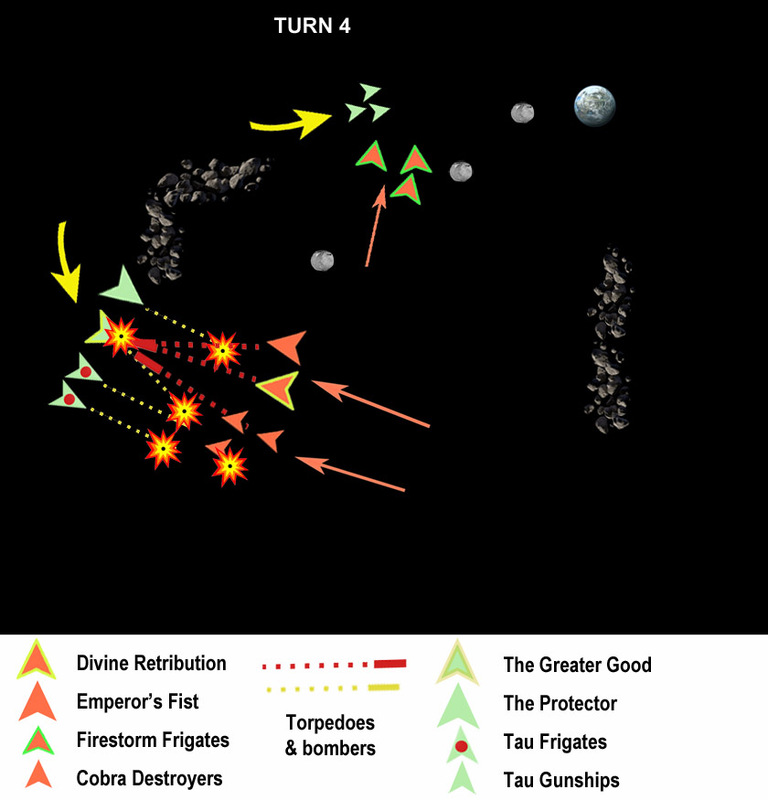 According to Imperial authorities, soon after the Hegira defeat, Commodore Hennard ordered all remaining naval assets in the Sculptor System to gather under his command in orbit above Sculptor IV–then launched his attack against the Tau flotilla orbiting above Dar Sai (Sculptor IIIb). The Imperial attack was decisive. A Tau cruiser and six escorts were destroyed, at the cost of Commodore Hennard’s flagship, Divine Retribution (Tyrant-class Cruiser), and the Stellar Falcon (Cobra-class Destroyer). 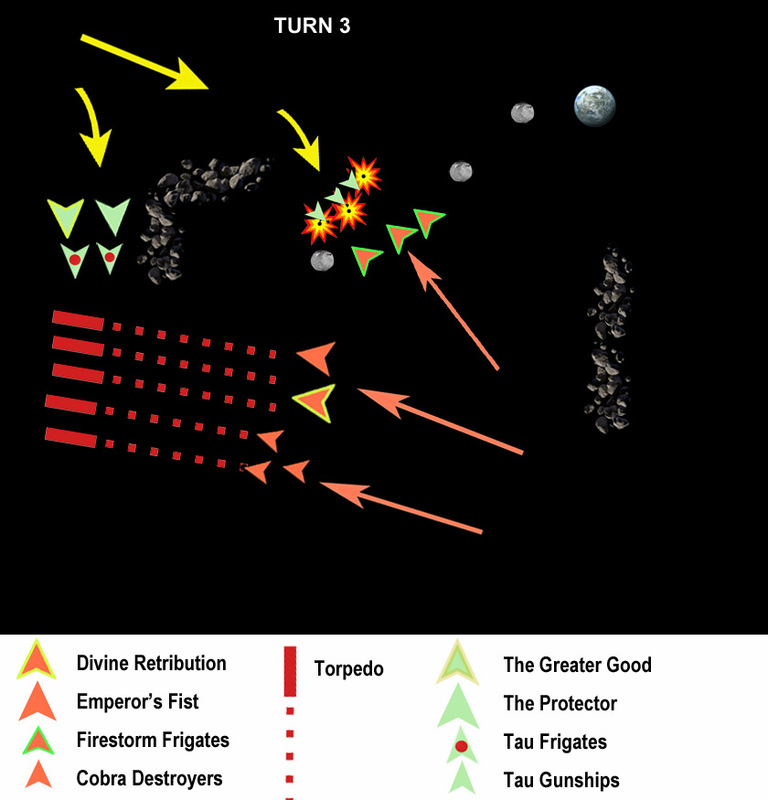 The rest of the fleet’s vessels–The Emperor’s Fist (Dictator-class Cruiser); three Firestorm-class frigates; and two Cobra-class destroyers–suffered minor or no damage. Only xeno cruiser escaped the Imperical forces. According to a voxcast earlier today, Commodore Hennard himself barely escaped death, exiting his critically damaged ship by shuttle only minutes before it was engulfed by nuclear fire. It is reported that the Tau commander, Kor’el Dal’ta’ai, was killed when his ship was crippled and pounced upon by a swarm of Imperial frigates and destroyers in the final moments of the battle. Imperial Navy forces approached Dar Sai at high speed, as Commodore Hennard was determined to deal with the xeno threat so that he could turn his attention to the ork threat near Hegira. The fleet was deployed in a rough line, with Divine Retribution and The Emperor’s Fist centered between the frigate and destroyer squadrons. 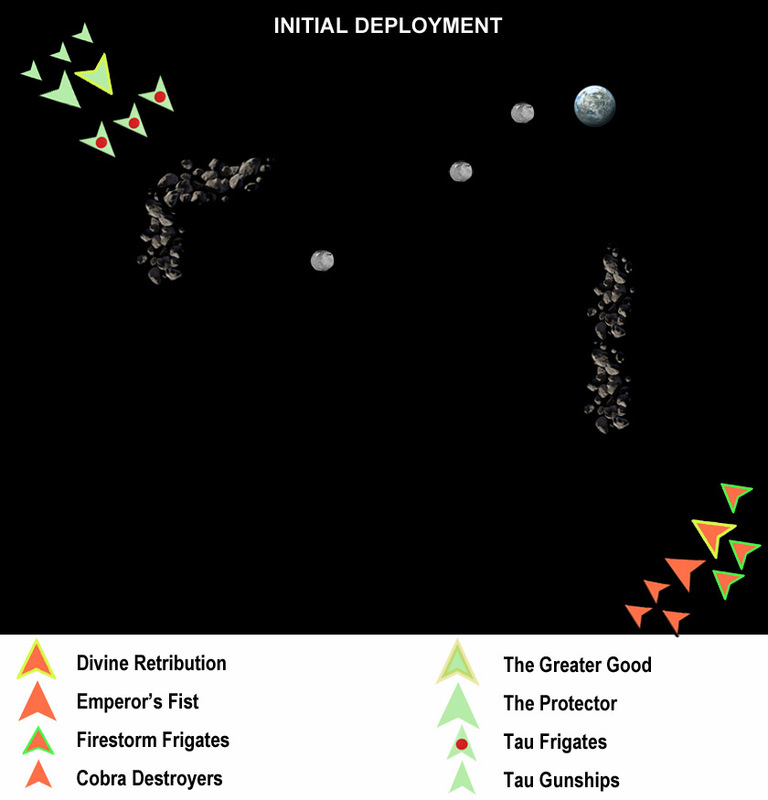 The Tau were deployed behind one of the asteroid fields that orbited Dar Sai. Two Protector-class Cruisers, The Greater Good and The Protector, were screened by three Castellan-class escorts to the bow and three Orca-class gunships to the stern. At Commodore Hennard’s order, surveillance satellites above Dar Sai were maneuvered to scan the moon’s asteroid fields, and the Tau location was discovered–and the data transmitted to the Imperial fleet. Thus, Commodore Hennard knew exactly where his prey was waiting. 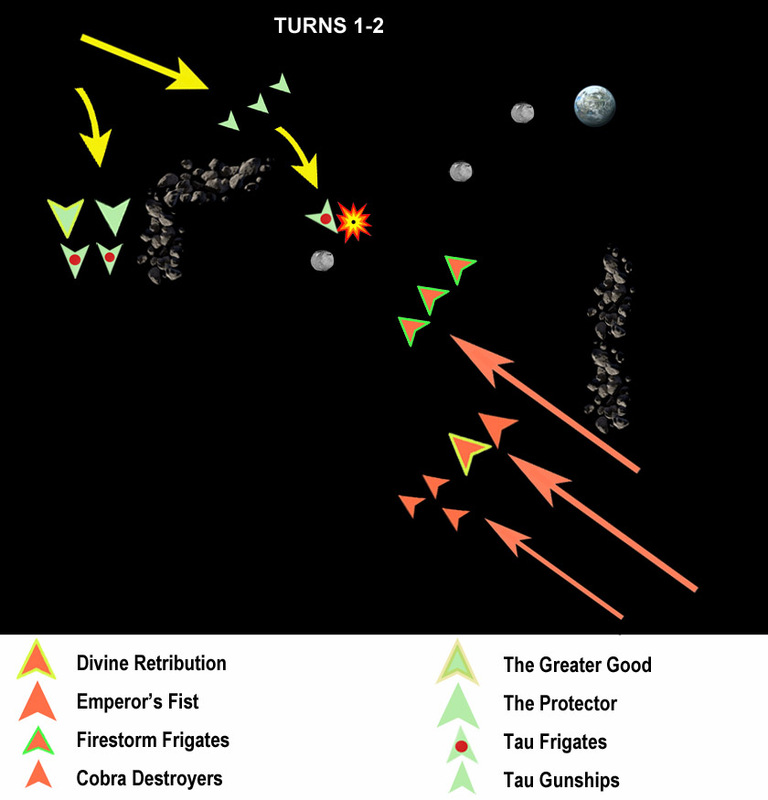 The Imperial fleet moved steadfastly toward the Tau fleet, while the Tau split their forces. The two Tau cruisers, screened by two frigates, moved to the starboard and advanced along the length of the asteroid field. The gunships, led by a single frigate, moved to clear the asteroid field to the port side of the fleet. Having maneuvered closer to the Imperial Navy, the Tau gunships and single frigate cleared the asteroid field, with the frigate outpacing the slower gunships in its eagerness to close with the enemy. The frigate took a position behind a large planetoid, attempting to use its bulk to screen the ship’s presence and prepare an ambush. If the xenos hoped for a surprise attack, they were soon disappointed. The Imperial’s long-range augeries detected the Tau frigate, and Commodore Hennard ordered his frigate squadron, led by The Dauntless, “all ahead full” to attack the Tau craft while it was isolated from its slower brethren. All three Imperial frigates rushed forward eagerly, and, evading the Tau vessel’s initial volley of torpedoes and its railgun battery, the frigates destroyed the xeno threat with a volley of cannon fire and torpedoes. The intensity of fighting grew over the next hour. Anticipating where the main Tau force would break clear of the asteroid field, Commodore Hennard launched a massive torpedo spread–12 nuclear-armed missiles–at the site. Even if the missiles failed to strike a xeno ship, the commodore later explained, the sheer scope of the torpedo wave would force the Tau to engage in evasive maneuvers, interfering with their targeting as Imperial ships raced forward ready to fire. Commodore Hennard guessed correctly. The Tau appeared from behind the asteroid field, and their ships were forced to slow and devote their initial volley of fire at the torpedoes. A squadron of xeno fighters also were launched to deal with the Imperial torpedoes. 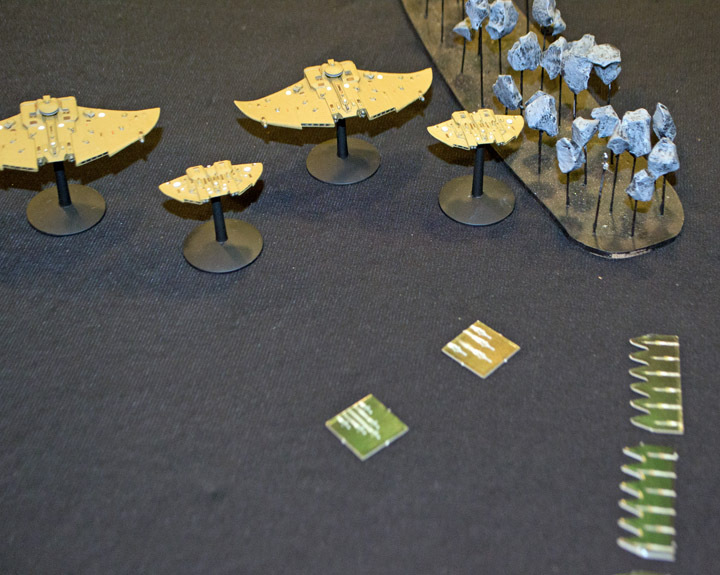 Meanwhile, closer to Dar Sai, the Imperial frigate squadron closed with the Tau gunships. The xeno vessels fired a small torpedo wave at the frigates, which opted to “burn retros” and buy time for their gun crews to shoot down the torpedoes. This was quickly done, and the frigates turned their next volley against the gunships and destroyed one. At this point, fate intervened decisively for the Imperium. As the few remaining Imperial torpedoes sped off into space, the Tau fleet swung to face Fleet Corvus and fired every weapon in its arsenal. To their horror, however, the Tau discovered that their targeting systems had miscalculated the range of the Imperial ships. None of their technically advantaged weapons struck home. Their initial volley squandered, the Tau lost their one chance to cripple the Imperial fleet with little loss–and had, instead, put their ships in range of the entire array of weaponry available to the Imperial cruisers and destroyers. Equally ominous for the Tau, both cruisers failed in their attempts to reload their torpedo bays. As the battle continued, the xeno capital ships would be denied the use of one of its most powerful weapon systems. This proved a pivotal point in the battle. While The Emperor’s Fist launched wave after wave of Starhawk bombers, the gun-heavy Divine Retribution slowly turned and presented its broadside batteries and poured fire into the Tau. Both Imperial ships targeted the xeno flagship, The Greater Good, and severely damaged it. Not everything went the Imperial way. The two Tau frigates confronting the destroyer squadron managed to destroy one ship, the Stellar Falcon, but took little return damage, as the xeno fighter squadron successfully intercepted the destroyers’ torpedoes. Closer to Dar Sai, the Tau gunships realized they were vastly outgunned and swung away from the battle, seeking to escape. The Imperial frigate squadron gave chase. Click here to read Part 2 of the battle.